This year Raymond Weil has been supporting the Realteam sailing team in the form of being its official timing partner for the D35 Trophy on Lake Geneva and the GB32 Racing Tour worldwide. As part of this partnership, they have released a new Freelancer dive watch for the sailing team that that forms part of their 2016 collection. Coming in a 42.5mm sized case (11.8mm thick) with 300m water resistance, it is available in polished stainless steel or with a black PVD coating, but today I am sharing the former with you. The rotating bezel is unidirectional and in black ceramic. Indicators are, of course, lumed (Super-LumiNova), as is necessary for a diving watch. Rather than using the more commonly seen small window between 3 and 4 o’clock that just shows the relevant date, Raymond Weil have chosen to open it up to cover three dates and extend to 5 o’clock, with an arrow and the 5 o’clock marker doubling up as indicators. Anyone who has known more than their fair share of watch people will know that date window placement is something that people can have quite particular views about. For those who do not like their date window between 3 and 4 o’clock this extended window, with its curvature and length, may be more to their liking, as it is, in a way, balanced in length and placement by the ’50’ on the bezel. Behind the attractively decorated case back is the automatic Calibre RW4000 with a power reserve of 38 hours. The new Freelance Diver comes on either a black rubber strap with stainless steel or black PVD (for those models) clasp or bracelet. At the outset I mentioned how this new model has been part of 2016’s D35 Trophy on Lake Geneva, but there is a personal touch to this partnership. Mr Raymond Weil himself was a member of the Geneva Yacht Club. 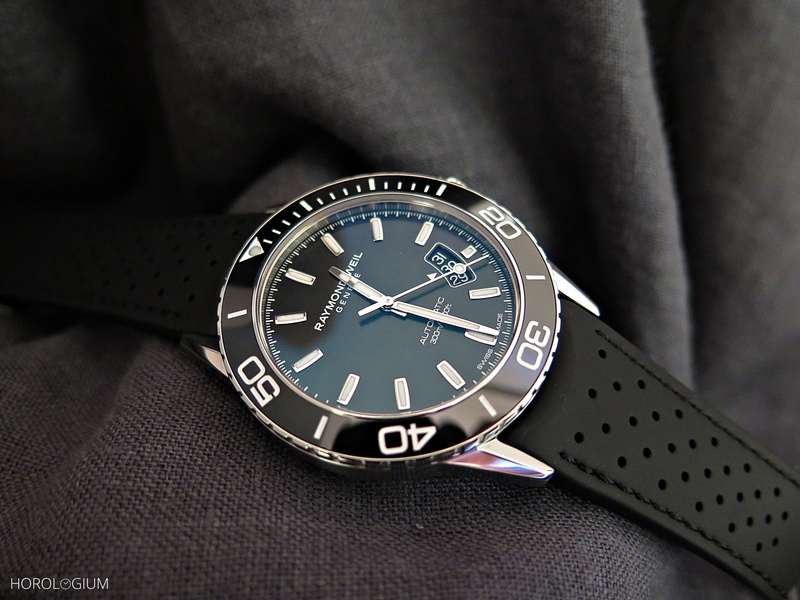 The Australian RRP is $3,195 on a rubber strap and $3,395 on the bracelet.